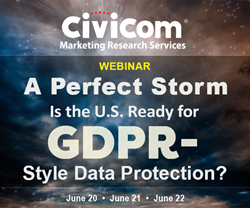 Civicom Marketing Research Services, a leading global provider of market research solutions, will host a webinar on the convergence of the timing of the effective date of the General Data Protection Regulation (GDPR) in the EU with the Facebook-Cambridge Analytica scandal, and the influence of both on the potential for increased U.S. data protection. The webinar will be available in several time zones on June 20 to June 22, 2018. The Civicom webinar will address the future of U. S. data protection in light of the GDPR and its potential impact on U.S. privacy legislation. Market research services provider Civicom has consistently served clients based in the EU for years and is in compliance with GDPR. As a global provider of telephone and web-enabled market research solutions, Civicom will address one of the most pertinent issues that impacts consumers and businesses alike – U.S. data privacy and its security. The timing of the GDPR implementation and the Facebook-Cambridge Analytica hearings raises the issue of whether the U.S. needs similar restrictive data protection regulations to be imposed on businesses that operate using U.S. consumer data. Civicom will delve into whether or not the same stringent requirements should be adopted in U.S. legislation and whether a demand for tighter data protection in the U.S. looms on the horizon. This is an issue that significantly impacts the handling of respondent data in market research studies, as well as the needs of every U.S. person. This webinar will address some of the history as well as the differences in how the EU and the U.S. view data protection.